Technology has definitely allowed us to take care of patients better and faster. The traditional method of producing a prosthetic socket is to take the impression of the patient’s residual limb, fill the impression with plaster to create a plaster model, modify that model, and then fabricate the socket over top of the model. 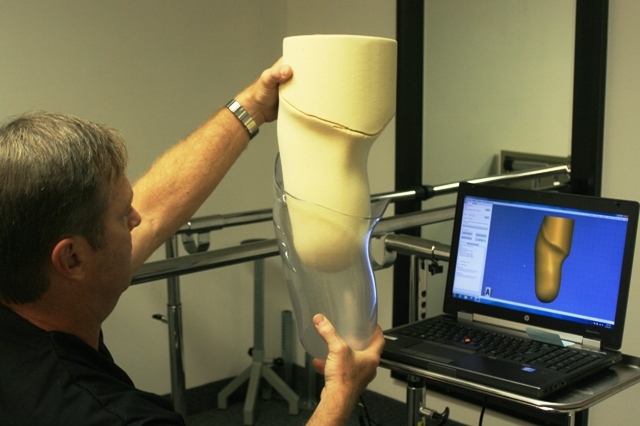 We use a handheld scanner, which uses structured light technology, to take a scan of the residual limb. 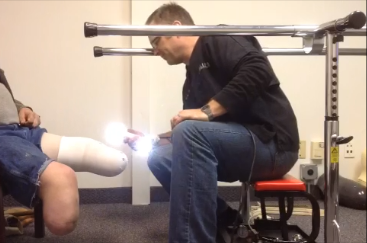 Miller Prosthetics & Orthotics is using state-of-the-art technology to deliver faster service and comfortable products to amputees in the Mid-Ohio Valley. The Parkersburg-based company’s high-tech theme extends throughout the business, not only for the materials used in artificial limbs, but also for the measuring, fitting and production of the prosthetic socket. Using custom software and mobile apps, Miller Prosthetics is able to run a paperless office to keep the workflow and information storage efficient and organized, enabling clinician and owner Mark Miller to focus more time on serving the patient. Along with fitting amputees with comfortable prostheses, MPO provides all types of orthotic services such as fitting knee braces, back braces, ankle-foot orthoses, and arch supports. MPO offers no-charge consultations for new amputees struggling to adjust to their new challenges, as well as existing amputees who are simply not comfortable in their current prosthesis. Miller Prosthetics is also available for in-service sessions to educate area nurses, physical therapists and other caregivers about how to treat patients with limb loss.